​We could use your help. 'THANK YOU, LOYAL LISLE ALUMNI--YOU DID IT! Thanks to your generous donations, we will be awarding a record scholarship amount in 2019. Our $20,000 in total scholarships will exceed the $18,000 target we set three years ago---and it is only possible due to your growing commitment of financial support for these commendable Lisle students. Your contributions now fund the following $2500 awards that also honor some outstanding names associated with Lisle High School that you will recognize:"
​has awarded $180,000 worth in scholarships. Become a Partner with the CNF & donate today. We invite you to join us in our year end scholarship fundraising drive, which we call “Partners for Excellence.” The CNF (Carlin Nalley Foundation) was created in 2005 by Kurt Grutzmacher (Lisle Class of 1976) to acknowledge the immense value of his complete educational experience at Lisle High School and to honor our legendary coach and educator. In 2019, the foundation will now provide $20,000 in scholarship awards to eight exceptional senior Lisle students who have achieved excellence across a range of academic, artistic, and athletic, and service activities during high school. This growth from $16,000 in 2018 has been fueled by the generous contributions and enthusiasm of you, the loyal alumni, who share the love of Lisle High School and the commitment to help today’s students have the same experience at our small but outstanding school. So far, we have distributed over $180,000 in our history, helping dozens of great kids to pay for secondary education. As a parent of a high school senior looking at the high cost of college, I know these kids and their families need this help. In this year’s Partners for Excellence campaign, we aspire to raise more than $20,000 during our fall campaign to match the size of our scholarship commitment. In order to continue inspiring excellence and help terrific Lisle students achieve their educational goals beyond high school, we are asking you to consider contributing a financial gift before the end of the year. As CNF is a 501(c)(3) organization, your gift may be tax deductible and matchable by your employer. Giving options and details are included below. Nothing is more inspiring for us on the CNF Board than seeing you, the alumni, get into action with us. Please support us as we work to grow our mission. All the best to you and your families, and I look forward to hearing from you before the end of the year. ​Partners for Excellence was selected as our year-end scholarship fundraising drive slogan as an acknowledgement of LSHS’s (Lisle Senior High School) being named the top high school in DuPage County. As a graduate of Lisle High School, you are part of a proud tradition of education that goes back 60 years. The CNF (Carlin Nalley Foundation) created in 2005, celebrates that experience by providing scholarships to Lisle students and serving as the school’s alumni association. Thanks to you the CNF has awarded NEARLY $200,000 in scholarships to deserving Lisle Senior High School Seniors. In order to continue inspiring excellence in these academic programs and to help additional deserving Lisle students achieve educational goals beyond high school, we are asking you to consider partnering with the CNF by contributing a financial gift today. The Foundation Board has worked hard over the years to make sure every dollar count including covering operating expenses, meaning every dollar you give ends up in a scholarship. The Carlin Nalley Foundation is a tax exempt 501-C3 charity, and any contributions you make are tax deductible. Ask your employer if they have a charity gift matching program. If they do please consider adding CNF. ​Want to Double Your Gift at NO COST to you? 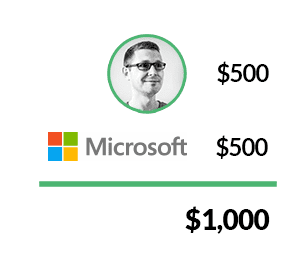 Many corporations match donations made by employees to the Carlin Naley Foundation, to support employee charitable giving, and to extend corporate philanthropy. 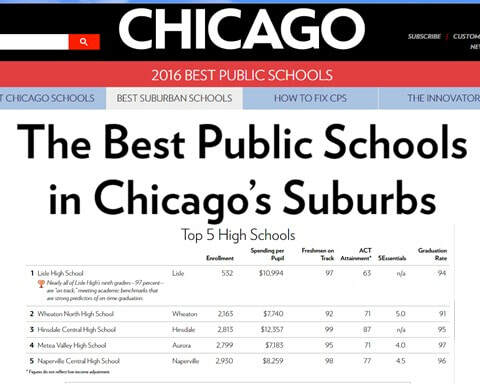 ​Congratulations To Lisle Sr. High School Ranked #1 in DuPage. Click image! ​The Carlin Nalley Foundation is a tax exempt 501-C3 charity, and any contributions you make are tax deductible our EIN Federal Tax ID # (26-1987884). The Foundation Board has worked hard over the years to make every dollar count. The Board has also covered operating expenses, meaning every dollar you give ends up in a scholarship. Also, if you work for a company that provides charitable matching for your donations, your contributions to the foundation may be effectively doubled by your employer.